The Imperial Archives is a collaborative encyclopedia for everything related to the history of the Galactic Empire. Registered users may create or edit articles to create a comprehensive database for Imperial citizens. <Darth Taral> Took me 8 years but I just wanted to make sure I passed well. <LGEN Arya Solus> Of course, academy protocol does state to take as long as you require with taking your tests. "The Emperor has laid a huge responsibility before me, and my Imperial Intelligence personnel are doing a wonderful job of meeting my requests. I really cannot comment on any of the specific programs or initiatives we are putting in place, but the people of the Galactic Empire can rest assured II will continue to be the premier intelligence agency across the galaxy. My vision is to readily address the Galactic Empires intelligence requirements in order to ensure victory for the Galactic Empire across the galaxy." 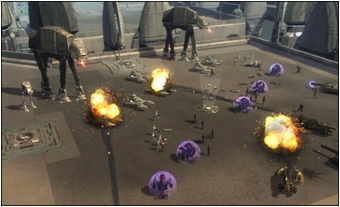 PRAKITH (MILITARY) – The Imperial Academy’s TIE Squadron School played host to a variety of experimental TIE fighter designs. Presiding over the event was the Academy Commandant; Secretary Auberin Jaxson; Army Commanding Officer, Lord General Solus, and Naval Commanding Officer; Lord Admiral Drenall all of whom eagerly observed the performances. The experimental designs provided through Corellian Engineering Corporation and its subsidiaries covered a variety of demands as the Navy seeks to expand its fighter capacities for patrols and capital ship support. "Imperial Proclamation - Hosnian System "
Date: Year 19 Day 197 Onboard the Trading II [GE] Agrilat Trade Centre in system Bosthirda (288, 318). Coruscant (IPA) quot; The Galactic Empire is communicating to the galaxy that the Hosnian system of the Byblos sector is declared to be part of the Empire’s sovereign territory. Under the Imperial Territories Act, the Hosnian system is subject to governance by His Majesty, Emperor Seele I, who has decreed the Byblos sector to be a contiguous component of the Empire, and part of the Amber Region under the stewardship of Grand Moff Icarus Carinae. Any persons and organisations which, without proper authorisation of the governor of the Byblos Sector, stake claims or construct any semi-permanent and/or permanent structures within Imperial territory are committing a criminal offence under the Imperial Territories Act. It is also a crime to sell, purchase, trade, or gift any such stakes or constructs that were established in violation of the Imperial Territories Act. Punishments for such offences may include fines, addition to the Imperial Trade Blacklist, refusal of visas to access Imperial territory, and imprisonment. ...the Executor-class Star Destroyer Imperious was renamed IMS Lennorian on Year 18 Day 361, in remembrance of the late Vice Admiral Mayas Lennorian? ...after the Galactic Empire fought two campaigns to secure control of Thyferra, the system was subsequently reclaimed through diplomacy? ...the Emerald Region encompasses the cradle of galactic civilization and is renown for its historic, political and cultural significance? ...despite originally intending to join the Imperial Navy, Beric Staghorn instead chose to become part of Regional Government after graduating from the Imperial Academy? Read Getting Started and Editing Help. Use the Sandbox to practice your skills. Comply with the Archive Protocols and Guidelines. Finally, make your own character page! Start by typing your name in the Search box, and clicking on "Edit". If you have any questions, contact the Chief Editor on irc in #cmg-empire or by email at archives@swc-empire.com. This page was last modified on 5 January 2019, at 17:33.